The top quark is a unique particle due to its phenomenally high mass. It decays in less than 10 to -24 seconds, before it has time to interact with any other particles. Therefore, many of its quantum numbers, such as its spin, are transferred to its decay particles. When created in matter-antimatter pairs, the spins of the top quark and the antitop quark are expected to be correlated to some degree. 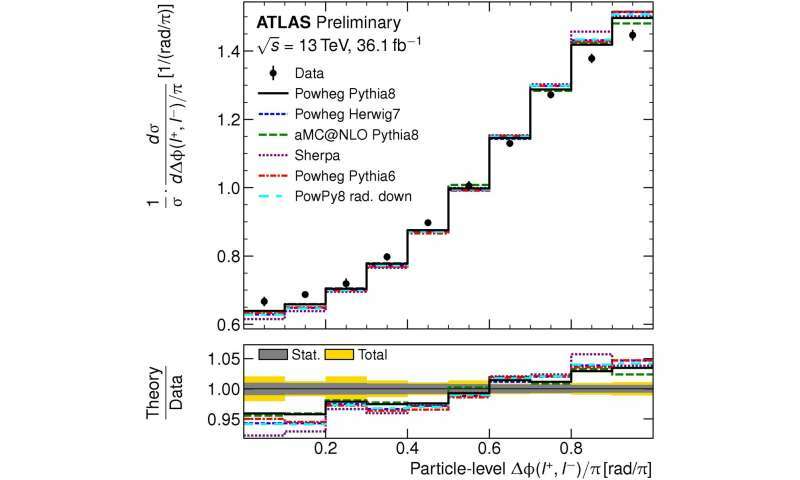 By measuring the angles between the top and antitop decay particles, the ATLAS experiment at CERN has not only measured this degree of correlation, but found it to be higher than what is predicted by calculations based on the Standard Model. This is not the first time that experiments at the Large Hadron Collider (LHC) have probed spin correlation in top events. Both ATLAS and CMS have previously published measurements using the same observable and also found the spin correlation to be higher than expected, but at the time did not have sufficient precision to make a statement. This new result has significantly reduced uncertainty due to a much better understanding of the detector and the vast amount of data now available at the LHC. New physics or poor modeling? What could make top quarks spin together more than they should? There are a number of possibilities. The first is that our understanding of quantum chromodynamics simply isn't sufficient to describe data at this precision. ATLAS has investigated this possibility thoroughly, and at the moment, nothing obvious stands out as a culprit. Indeed, since both ATLAS and CMS have seen this effect multiple times in different datasets and using different simulations, it seems unlikely to be a simple modelling issue but perhaps something more fundamental in our understanding. The possibility of a lack of understanding of the detector has also been ruled-out. Could this be something new? Does science know how matter arises and from which it forms and how? In particle collisions, the fragments of these "convicts" are being trashed by scientists to destroy each other and to "see" scientists from whom they have been harmed. But, most importantly, science does not know what is in their "empty" pipes, nor does it understand what is happening with that substance inside the tube, when a particle in collision drives it to move faster and magnetism increases. This top quark, in general, does not exist in nature, nor is it a saturated part of the particles in a collision. He is currently derived from that substance in the tubes, which science does not know to exist.